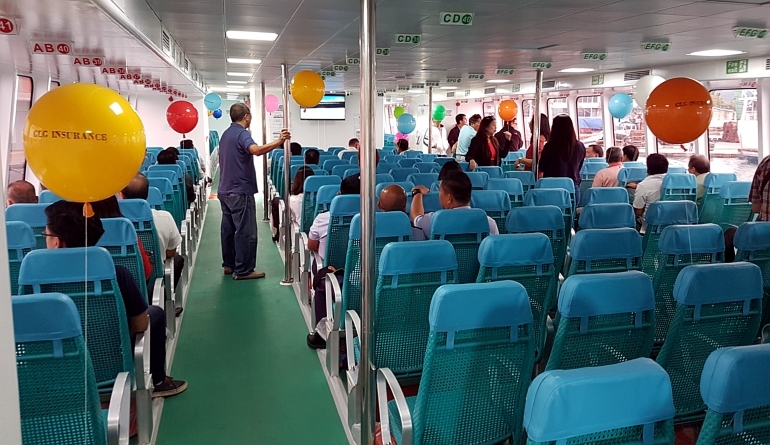 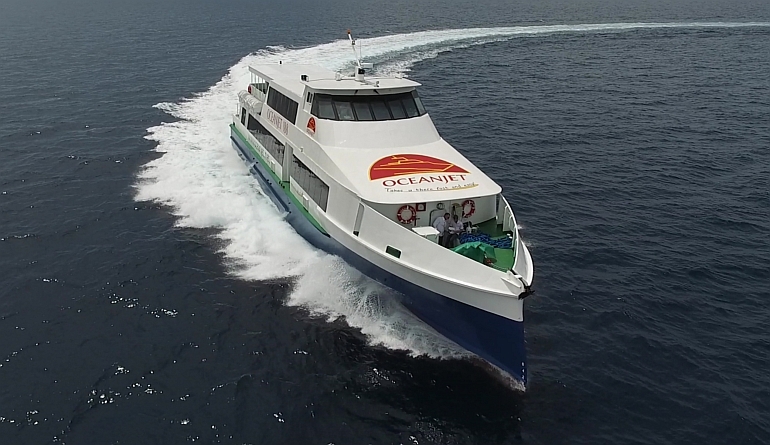 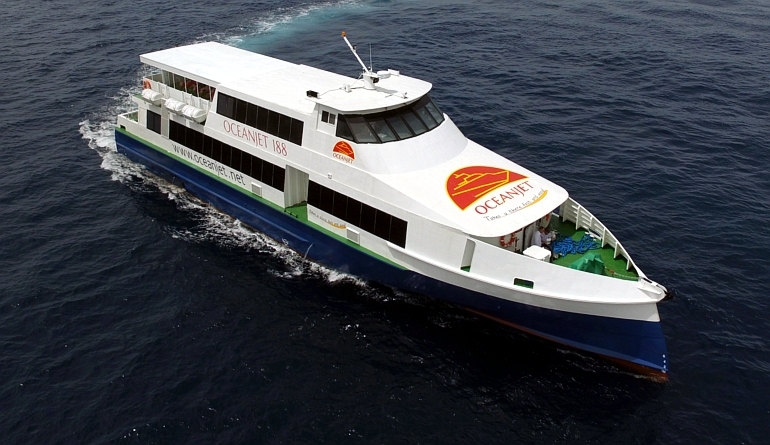 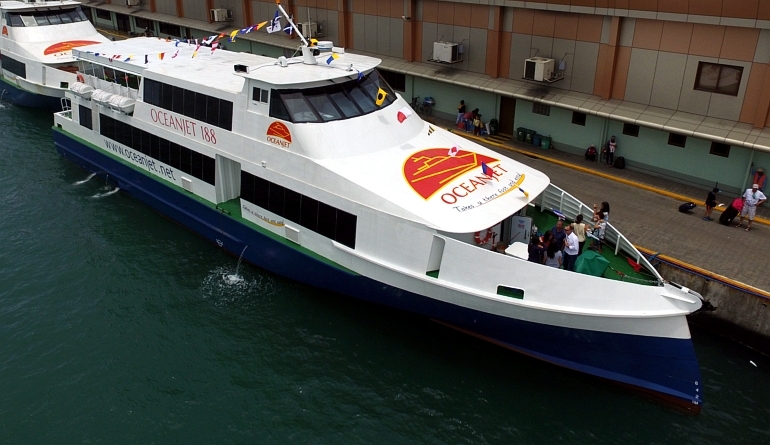 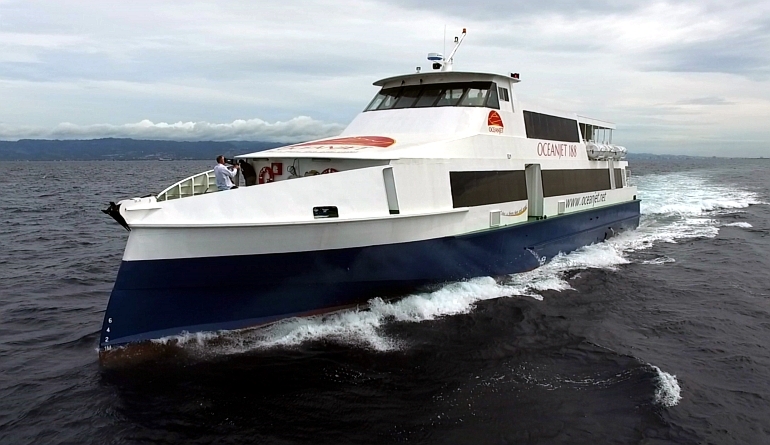 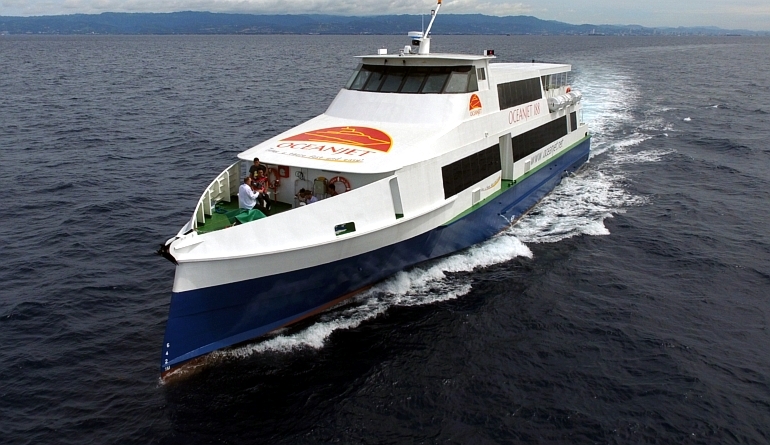 In July 2016 Global Marine Design travelled to Cebu, Philippines, for the launch of “OceanJet 188” for OceanJet Fast Ferries. 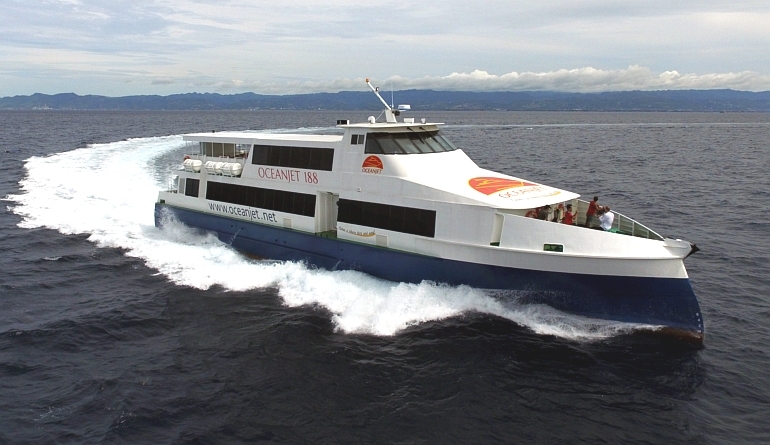 This vessel is the fifth 32m monohull ferry built for OceanJet from a Global Marine Design kitset and is the first to feature an ‘axe bow’ forward raking stem. 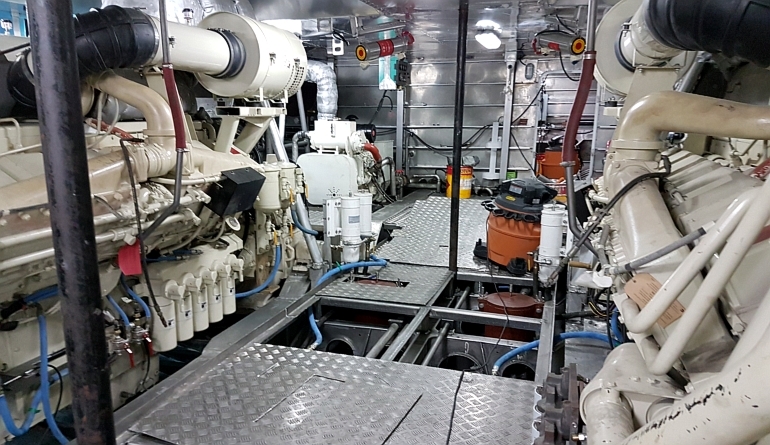 GMD was set the task and given free reign to design and kit an innovative bow module to minimise fuel consumption for this new vessel. 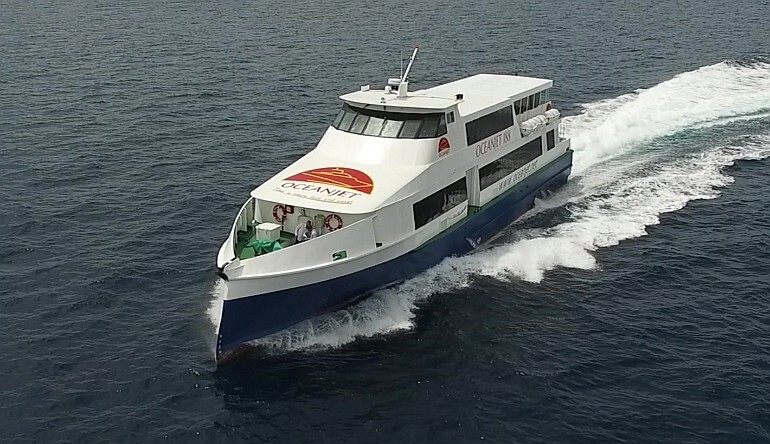 The resulting hull reduces fuel consumption by nearly 20% at 24 knots transit speed and has added 2 knots to the sprint speed, now 30 knots, all with changing just the forward 25% of the existing hull. 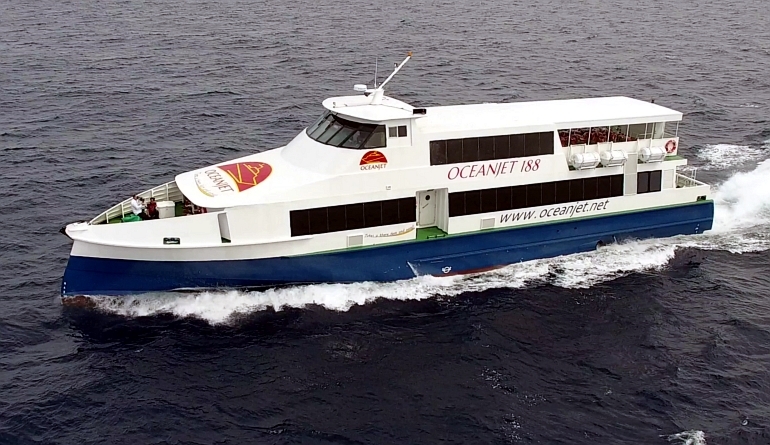 OceanJet have opted to save 10% off their previous operational fuel bill while increasing their loaded service speed 2 knots to 26 knots at 1700 RPM. 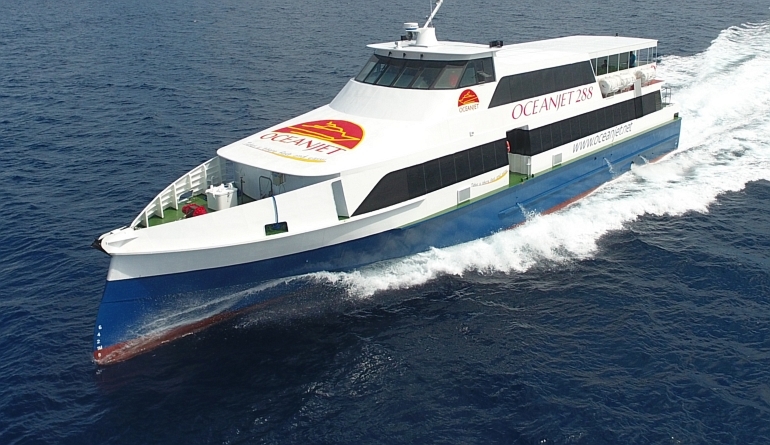 Reducing the vessels fuel burn by 10% is a huge saving for the operator with the added benefit of minimising the environmental impact of the vessels operations. 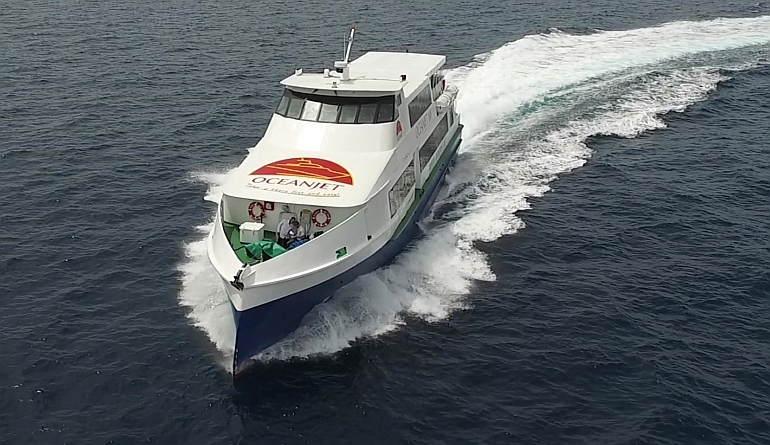 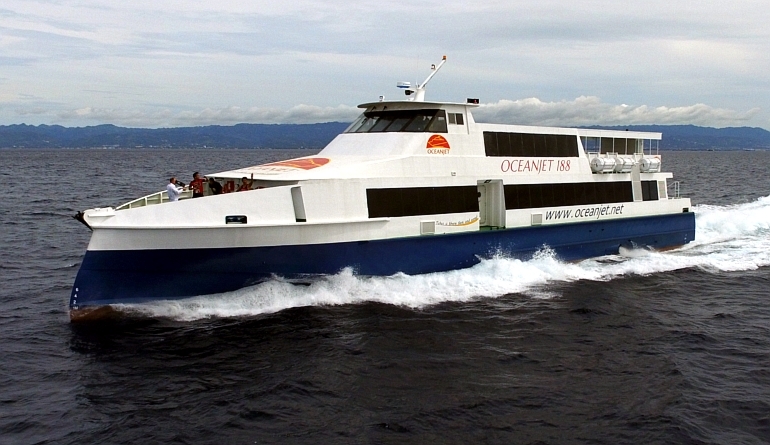 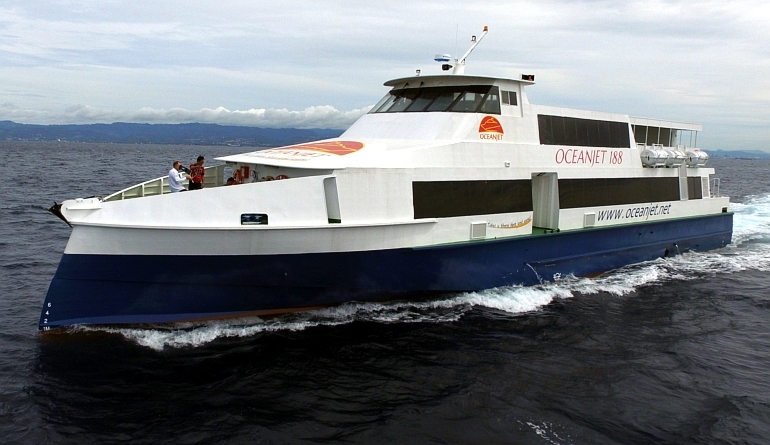 “OceanJet 188” went straight into service in the afternoon following the launch and blessing ceremony. 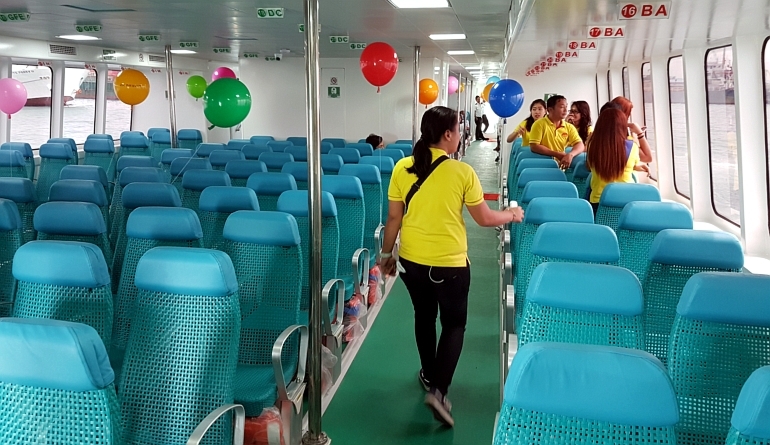 Long-time OceanJet passengers have approached the crew with positive feedback for the improvement in ride comfort and shortened passage times. 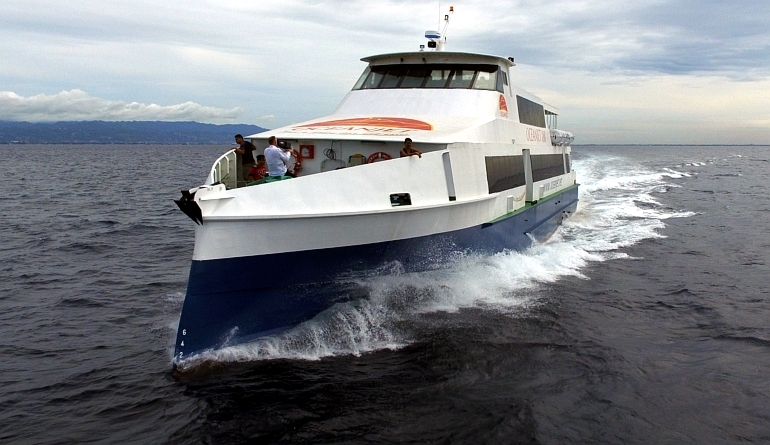 Using seakeeping software GMD estimates that the vertical accelerations, a main culprit in causing seasickness, has been reduced by 12%. 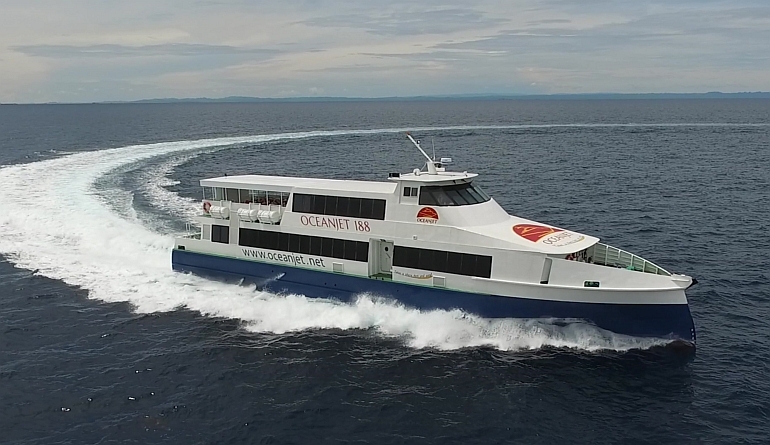 Following the huge success of this first axe bow ferry, OceanJet have placed orders for further axe bow vessel kitsets from Global Marine Design to continue to modernise and optimise their ferry fleet. 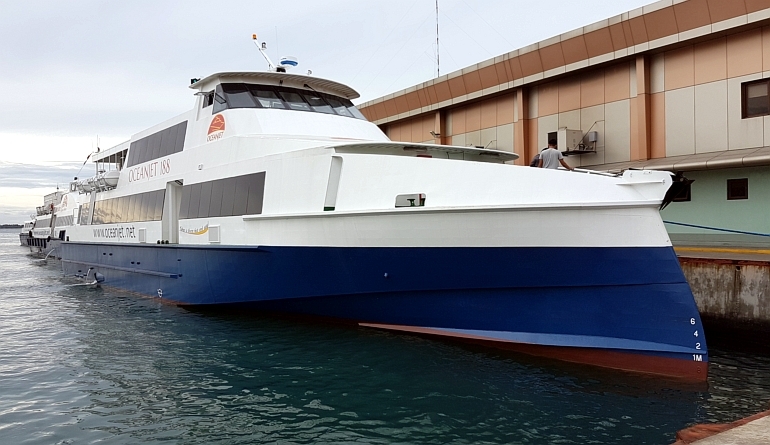 With structural plan approval by BV, this hull is also well suited for use in patrol or crew transfer roles, where speed and efficiency are of high importance. 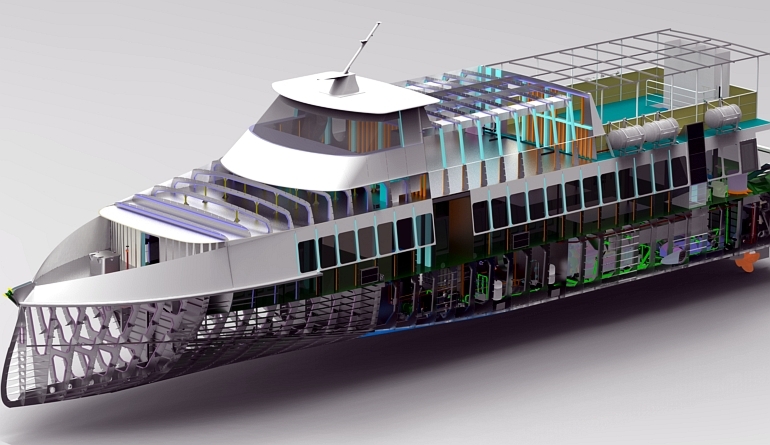 For more information on the 32m axe bow ferry or to discuss an axe bow modification for your own vessel please click ‘Contact Us’.